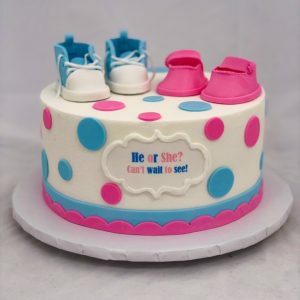 There is something extra special about a creating gender reveal cake, which is where the gender of the baby that mom is carrying is revealed by cutting into the cake. 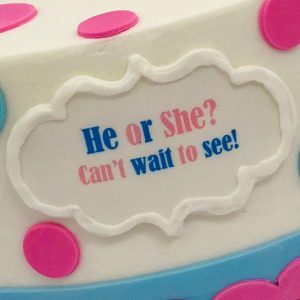 We feel so honored and special to know the gender of the baby before the parents even know! Often, we will receive an envelope or phone call from the doctor’s office with the gender. We then tint the cake batter or filling (or both!) 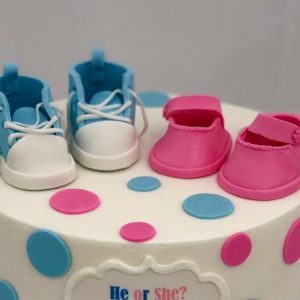 either pink or blue to coordinate with the gender that the mother is carrying. We then added 2 pairs of fondant baby shoes that we had created in advance. We made blue baby sneakers and pink mary janes ahead of time, so that they could dry and hold their shape. 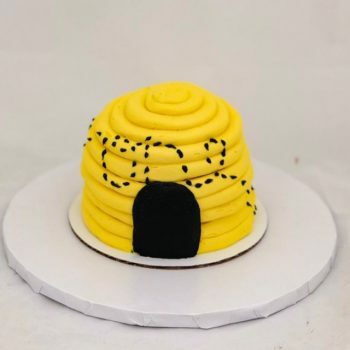 We then placed them on the cake as the topper. So what color do you think was on the inside…pink or blue? ?